The March 30th, 2018 episode of the informative and wide-ranging StreetsBlog podcast featured Human Transit author and educator Jarrett Walker, discussing how to communicate transportation and planning concepts to the public. The discussion included several fundamental conflicts that appear when discussing public transit, such as the completely rational difference urban and rural perspectives, differing definitions of safety, and why Silicon Valley reinventing the bus is not necessarily improving on the goals of public transit. …Many things that are government services in the city are your own responsibility at low density. If you live on a ranch, on a 100-acre ranch, the water department is your well, the sewer department is your septic tank, the police department is your gun, and the fire department is the pond! And of course you feel self-reliant, and of course you feel like you don’t need much government, because you don’t. …This whole notion that we should be having a debate about how much government is enough is silly because the answer is obviously it depends on the density you live in. So we have this stereotype in America that liberals are concentrated in big cities and they like more government, well of course – there’s simply more that has to be done collectively, more that a citizen can’t do for themselves, has to trust a collective to do, when you’re living at high density. It’s just a spatial, geometric fact. …If you are in a relatively fortunate position in your society, if you have substantially above-average income and/or substantially above-average education, you are going to be tempted to think about your personal tastes as being a good guide to what would work for everyone. The fundamental fallacy at the heart of it is when people tell a transit agency you’d have more ridership if you just did this thing that’s convenient for me. Transit agencies hear this all the time, it’s called stated preference, we know it’s meaningless. But this desire that everyone has to believe that deep down everyone else has the same tastes as they do and has the same priorities that they do. So when fortunate people make this mistake and start designing transit services for themselves or as though they were the design customer they end up designing things that don’t scale to the mass of people that we actually need to be serving and that aren’t actually hitting the right balance between price and quality that is appropriate to the mass of people that we’re serving, and the result is failed transit projects. Much of the tech industry’s …fundamentally arguing that what’s wrong with transit is that we are not sufficiently responsive to the tastes of savvy tech people with six-figure salaries. Well no, we’re not, because that’s not where we start. Transit agencies spend a lot of time listening to lower-income people. There’s nothing wrong with the fact that transit services are heavily used by low-income people. The way we make transit relevant to wealthier people is not to pivot away from low-income people as I’m seeing some studies suggesting now, instead we treat the low-income people as the early adopters, and we use the service that they support and build upon that to gradually make the service more and more useful in such a way that more and more people find it useful until finally you get to the point where we have the millionaire riding it. Elite projection is the mistake very commonly made by fortunate people… It’s the mistake of forgetting that if you are very fortunate you are a minority, and the way we transform a city with public transit is not to appeal to minority tastes. We are trying to get a basic product out there that a huge spectrum of people find useful, and that’s going to be very different from what the elite would design for themselves. The full 45-minute podcast is well worth your time, as are Walker’s site and book, if you’re interested in learning more about public transit and planning issues, and how we can improve our skills in thinking about and communicating about shared goals. Strong return on investment for the #KingStreetPilot according to data analyzed by the University of Toronto. Thousands are saving time daily. 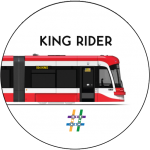 “The King St. pilot project has caused dramatic improvements in travel times and reliability on the TTC’s busiest streetcar route, according to data analyzed by University of Toronto researchers. 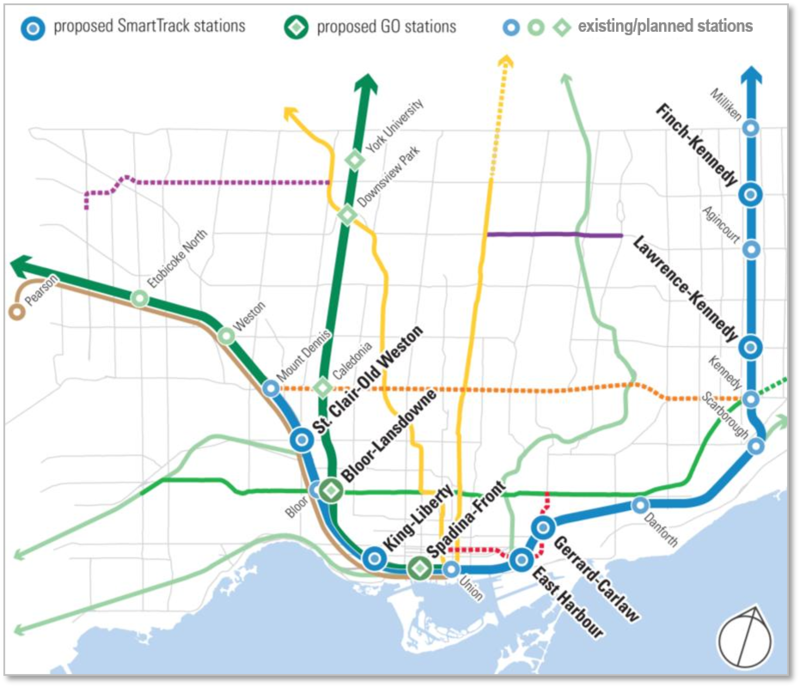 For those interested in SmartTrack and/or Regional Express Rail (RER) development in Toronto and the GTA, early October has several public meetings that may be of interest to you. With a goal of improving regional transportation in Ontario, Metrolinx has introduced the GO Transit Electrification project which focuses on upgrading the GO rail system throughout the entire Greater Toronto and Hamilton Area (GTHA). The electrification process consists of transitioning away from presently diesel-powered GO trains towards the use of direct electrical supply as a new power source. Some of the benefits offered by the electrification process include a rail system which has improved speed while also offering services in a wait time of 15 minutes or less. This includes fewer interruptions in addition to travel being enabled both ways throughout the entire day. In addition to the improvements, a potential development of 12 new stations may take place across the region, including 8 new locations in Toronto which would serve towards improving commuter access and convenience. These positive attributes may also serve as a way of mitigating some of the effects of congestion in cities by offering alternative travel choices. Additionally, electrification directly benefits the city’s environment and health through improvements towards air quality as a result of lower emissions being produced. Additionally, on June 15 the Ontario Government has introduced another option, of using hydrogen as a potential fuel source, describing it as a potential alternative based on its popular use in other metropolitan areas of the world. Hydrogen is explained as a safe and clean alternative which serves as an improvement from current practices towards both people’s and the environment’s health. 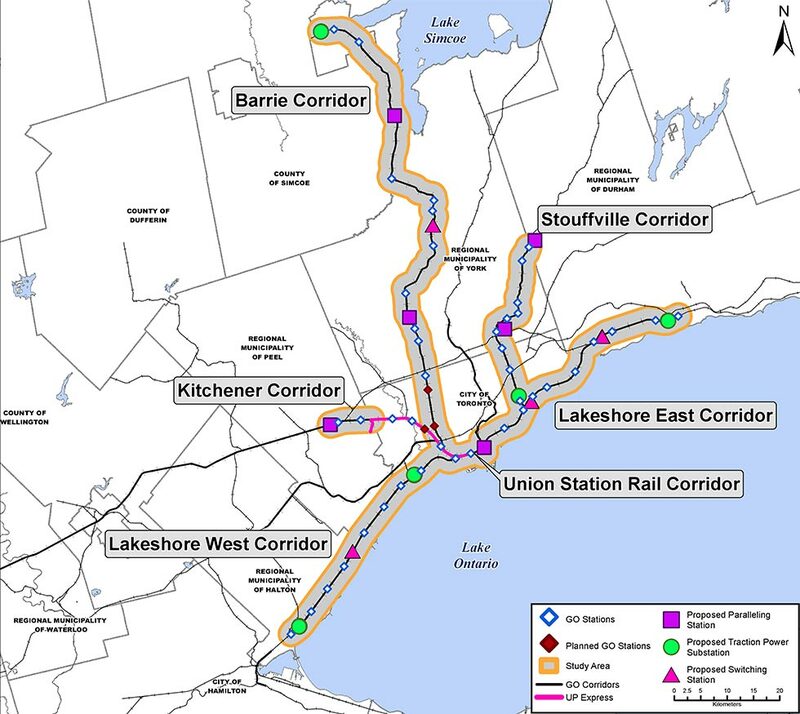 With a goal of selecting the best course of action when improving the GO rail system, consideration for the use of hydrogen as a potential source will continue during the electrification project. Studies will continue to explore the source and its benefits in the later months of 2017. Currently, the project is in the Transit Project Assessment Process (TPAP) which identifies the impact different aspects of developing the project may have through its development, while also focusing on implementing technical approaches to provide solutions towards issues. A series of 28 public meetings have already been held in the Greater Toronto and Hamilton Area (GTHA) and are entering into their third round of discussions. This involves two phases already taking place during 2016 which focused on the different physical requirements associated with implementing the changes and the influence these changes may have on the local environment. Presently, consultations are in their third phase of the TPAP, which basis a review of all the information already heard from the public as well as more feedback with the purpose of generating an Environmental Project Review (EPR) which will then undergo public review. To accommodate the Go Transit Expansion, additional implementation of infrastructure such as barriers would be used to shield areas which are visually impacted by the project, while also providing greater pedestrian safety from the rail system in places such as overhead crossings. Additionally, the project involves replacing bridges which are unfit for the new infrastructure, which would undergo construction to accommodate the necessary height clearance and barrier designs. Some frequent issues discussed by the public involve the concern over the requirement of clearing a 7-meter distance of vegetation from the rail corridor, which intends to prevent any hazards towards the rail system. This includes problems which arise from the required removal of trees from resident’s private properties. Additionally, a frequent point of discussion involves the noise and vibration coming from the electrified trains, including issues with the train’s impact on people’s livability; especially in areas where corridors pass residential areas. One possible strategy proposed involves the use of 5-meter tall walls as shields to prevent noise disruption coming from the trains. The project’s next steps involve focusing on completing the study by the end of 2017, which includes a public review from October to November and a review by the Minister until December. The goal of the project is to complete the construction process by 2025, whereby then service would become publicly available. The GO Transit Expansion will transform how rail systems operate in Ontario, with electrification working towards creating an improved transportation system for the years to come. Thomas Dybowski is a student at the University of Toronto in the Urban Geography and City Studies program. CodeRedTO partner Pembina Institute has released an important new report detailing some of the major success factors on current Ontario rapid transit projects, and how they can be applied in future. Most opponents to new light rail projects in Ontario aren’t opposed to rapid transit in general, but actually take issue with the process and how decisions are made. Best practices like engaging early, being transparent, and working closely with developers and landowners can go a long way to making a project more likely to succeed. What’s key is that communities can learn from one another as we quickly implement new rapid transit. 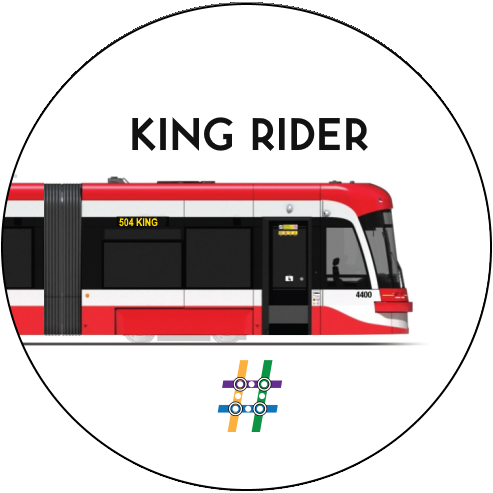 The current roll-out of rapid transit infrastructure in Ontario is one of the biggest infrastructure builds in the province’s history, with over $30 billion in investment from the Province of Ontario and major inputs from the federal and municipal governments. With such significant investments at stake, it’s important to get the process right. In this report, we examine engagement and planning processes around ongoing rapid transit projects in four Ontario communities to better understand the challenges and success factors associated with these efforts. 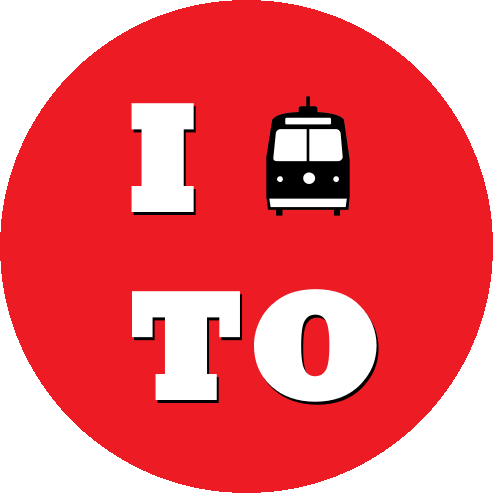 Who’s Advocating for Improved Transit Across Ontario? 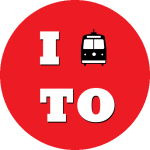 CodeRedTO was formed to advocate for better transit, for more residents, sooner. 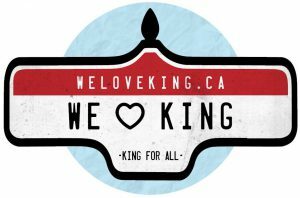 While our focus has always been the City of Toronto, we have partnered for several years with Move The GTHA, a collective of over two dozen major groups working toward better funding, better decision making, and better accountability on transit and transportation across the Greater Toronto & Hamilton Area. Better transit options and service are needed in all communities of course. 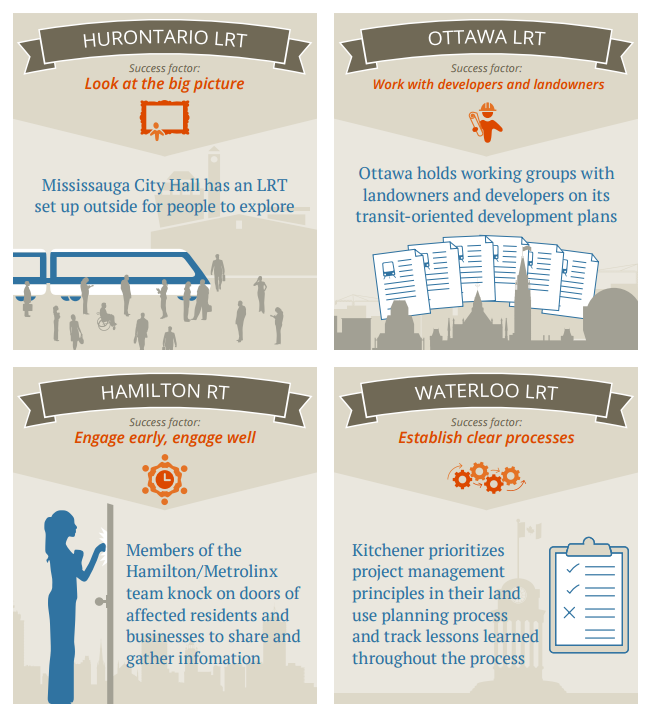 CodeRedTO also partners with some organizations in cities outside the GTHA, and supports any organization putting better transit ahead of partisan or technology ideology. Here is a partial list of groups we know of. If we missed you, email info@CodeRedTO.com to be added! Posted in information, partners | Comments Off on Who’s Advocating for Improved Transit Across Ontario?